Ever since my senior year of high school, I knew that I absolutely, positively wanted to study abroad during college. Needless to say, my expectations were incredibly high coming into this. I think everyone sets their expectations high for a semester abroad because it’s a big idealized thing. Traveling the world, making new friends, experiencing life in a new country, and getting some fire Instagram pictures. It’s supposed to be absolutely perfect, right? Wrong. So, so wrong. While this experience has certainly been incredible, there have also definitely been a few moments where my expectations have been way too high, compared to the reality of this experience. I’m going to be traveling to a new country every single weekend! 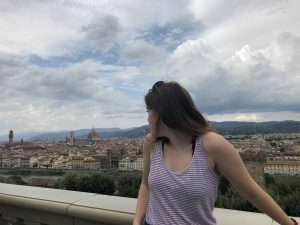 Being able to travel to a different country just as easy as traveling from state to state in America is a huge perk of being in Europe, but it just isn’t practical. For one, the costs of flights and accommodations add up quick. Two, it is so important to travel throughout the country you’re staying in! The different regions of Italy are so diverse, it’s almost like going to a different country when you travel from the South to the North. Finally, sometimes you just need a weekend off. While travel is fun and all, it can take a lot out of you. There’s some guilt behind spending a weekend in your own city and taking it easy, because you want to make every single moment you’re in Europe count, but sometimes you really just need a break to breathe and enjoy your new home. All of the walking around the city will make me lose weight so quick! WRONG. This was a huge misconception for me. 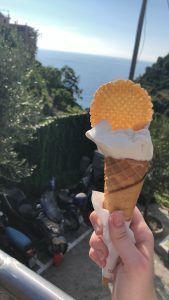 I thought that I could come to Italy and eat whatever I wanted because I would be walking around the city so much that I would just be continuously losing weight. Boy, was I wrong. 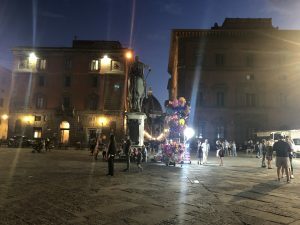 While I do walk everywhere, I didn’t take into account just how much pasta and gelato and bread I would be eating and how that would affect my body. Please don’t forget to eat some fruits and veggies, your body will thank you. 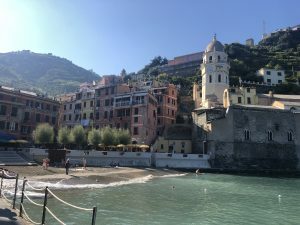 One of my favorite trips I took was to Cinque Terre! All of my classes are going to be super easy and I won’t have to put much effort in! 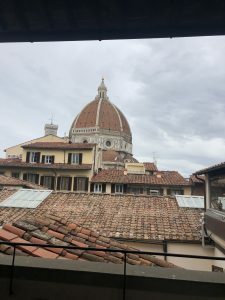 I’ve had to put just as much effort into my classes in Florence as I’ve put into my classes back home. The professors understand that you’re here for the experience of being in a foreign country, but it is STUDY abroad. You still have to show up for class and do assignments, or else this semester won’t count for anything back home. In some cases, I’ve had to put more effort into classes here in order to do well, because some of the classes I’m taking here are unlike any class I’ve taken before, so I don’t have much knowledge on the subject. The view from my favorite study spot, the Oblate Library. This was probably my biggest expectation, and rightfully so. I was fully expecting to absolutely love every second here, because that’s what everyone talks about. I’ve heard from former study abroad students about how much they loved their city and their classes and their apartments, because no one wants to talk about the bad times. I’ll be the first to tell you, that everything hasn’t been absolutely perfect. There have definitely been some nights I have FaceTimed my mom crying about how much I miss home, and that’s totally okay! There have been some hard times where I’ve felt like I’ve been missing out on things at home and I’ve felt uncomfortable here, but the good times far outnumber the bad. The most important thing, for me, is to remember to live in the moment and remember how lucky I am that I get to have this experience. While I definitely do miss home and my friends and family, I can’t really complain too much when I get to live for four months in a city with such an incredible history and culture. One of my favorite views in Florence, standing in Piazza della Santissima Annunziata facing the Duomo. It’s even more gorgeous at night! Elise is a fall 2018 student from Winthrop University.